6 on 6 Dodgeball action just like you remember from your elementary school days, but with some twists for even faster action. With no previous skills required, this league is an easy way to get involved in the leagues program! Games are played Tuesday evenings at the SRC. Teams will generally play in a similar timeslot each week, but can play at any time on Tuesday evenings. Games are approximately twice a week with both games generally occurring back to back, or with a small break in-between. For levels of play, please see the Competition Structure. Games are played as a best of 5 series. Teams must register 8-20 participants, and dress a minimum of 5 to start the game. Each team can dress a maximum of 20 participants and Divisional Teams are able to have a max of 3 designated imports. Please register online or at the Student Recreation Centre. Registration is open until Friday, Jan 4th, 2019. Below you will find the playoff schedules for all divisions. Please note that you may have multiple games in one day, so please ensure you look at the whole bracket to see when you might play if you continue to win. Due to ongoing concerns about weather and the University cancelling all classes, all games in the Dodgeball, 4v4 Soccer, and Ice Hockey Leagues are cancelled tonight (Feb 12th, 2019). During this time, vehicle traffic to access these facilities are encouraged to use North Parkade which will remain accessible from Marine Drive via Chancellor Boulevard. NOTE: For War Memorial Gymnasium, accessible drop-off and limited street parking will remain available along University Boulevard. In the event that no street parking is available, the nearest parkade is at Health Sciences Parkade. Use Blanca Street and Chancellor Boulevard. No traffic is to use the local neighbourhood streets within the University Endowment Lands. Use 16th Avenue west to SW Marine Drive then NW Marine Drive around the north end of the campus to Wesbrook Mall. Continue on NW Marine Drive around the north end of campus to Wesbrook Mall. 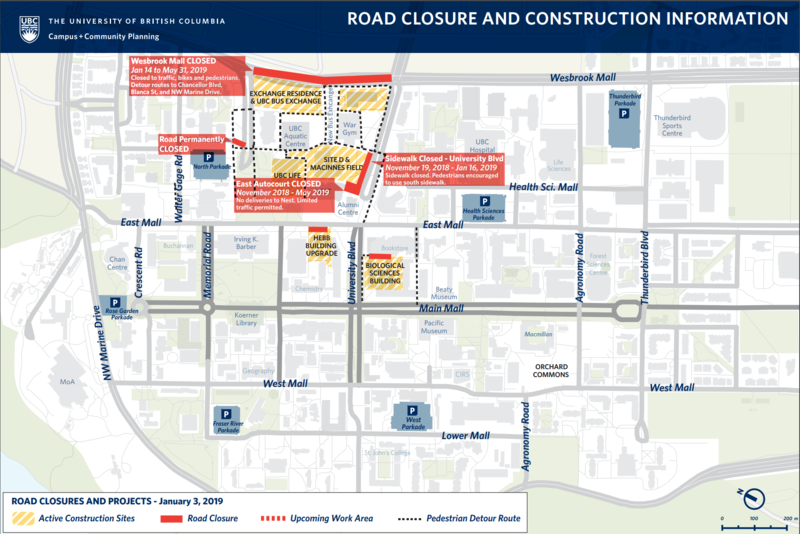 Use either Chancellor Boulevard to Blanca Street to University Blvd or 16th Avenue, or NW Marine Drive to 16th Avenue.